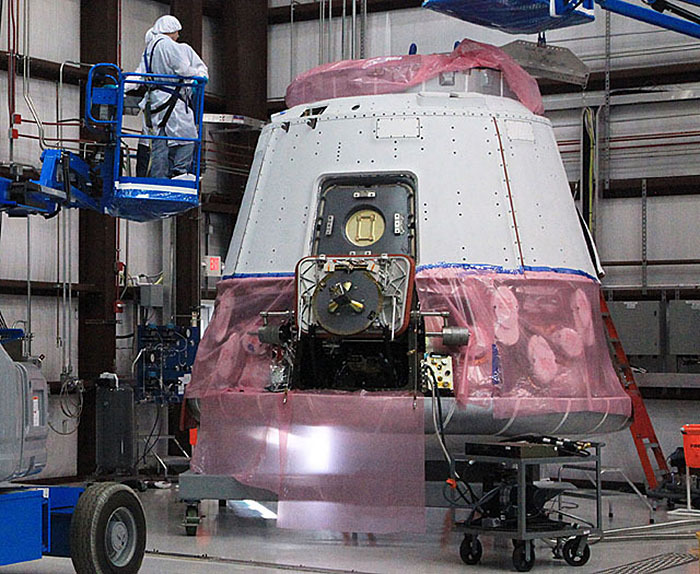 SpaceX is the sort of company that brings a smile to the face of many a space buff. Under the leadership of Elon Musk, who set the company up a decade ago in 2002, SpaceX has gone from strength to strength. Right now, SpaceX is aiming to make the first commercial flight to the International Space Station, using its Falcon 9 rocket and Dragon capsule combo. And guess what? There’s a model rocket available from SpaceX that you can build and fly. First things first: the only supplier we know of at the moment is Amazon, and they don’t mail the SpaceX rocket to all countries, so x-fingers you live in an approved locale. Even so, it’s an interesting item, and at about $30 USD, pretty fairly priced, too. 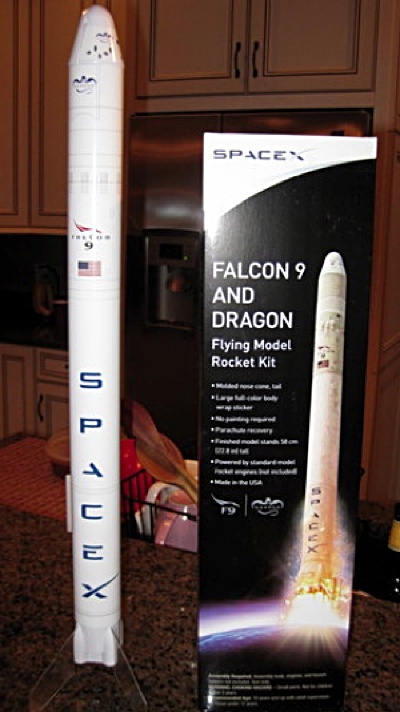 When assembled, the kit measures 580 mm (22.8 in) high, equating to 1:88 scale. 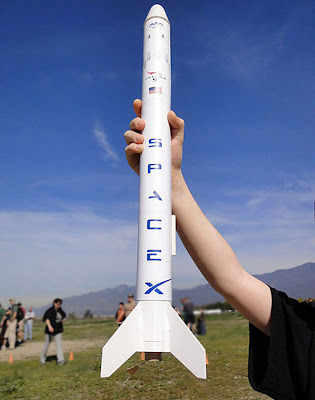 Assembly is very simple, and it’s compatible with Estes model rocketry products, which is a high recommendation, as this writer has flown many an Estes rocket off the pad, and it’s huge fun, even if you do stand to lose the occasional model. 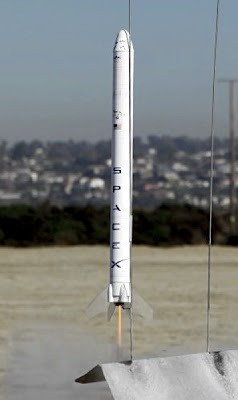 I recall one successful launch, moments after which my partner of the time decided that she was about to have our baby! 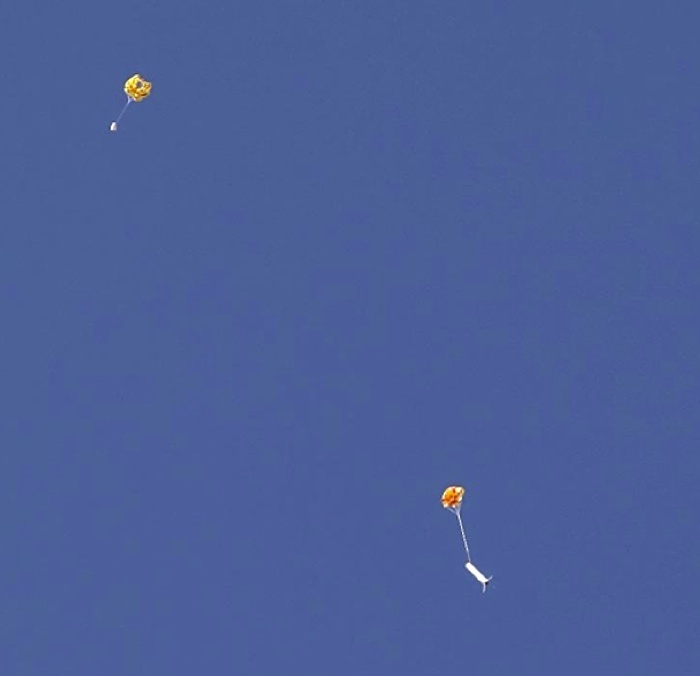 Suffice to say, the last I knew of that camera-equipped beauty was the sight of it drifting under its parachute, far away into the January mist, never to be seen again. I didn't have to time to fret about it though - after a speedy dash to hospital, I helped the midwife deliver a beautiful baby daughter! 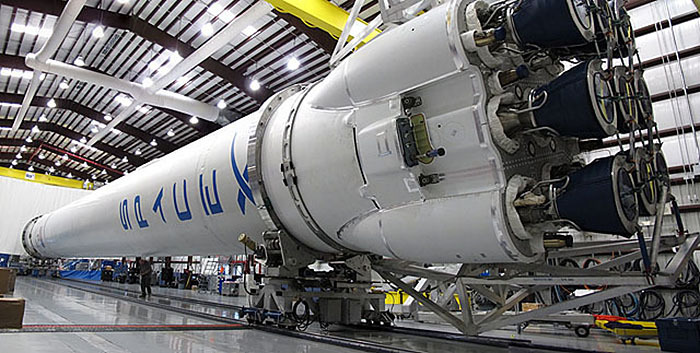 Back to the SpaceX kit. You can build it static or flying - it’s your choice, and a parachute is included for flight recovery. Non-scale, but necessary for model flying are the transparent tailfins, which you can leave off if you decide on a static display model. 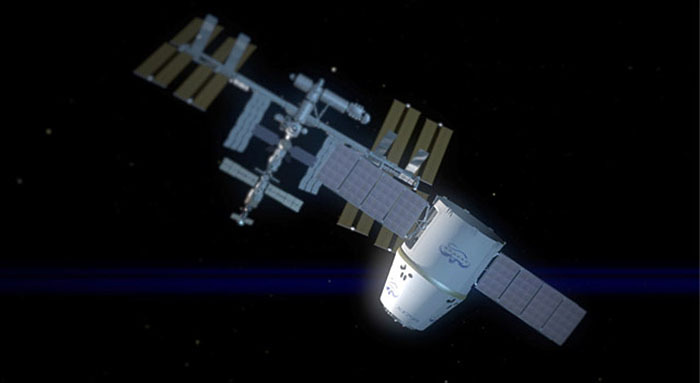 A great idea from a pioneering company, and good news for us that SpaceX is into the model spacecraft game. 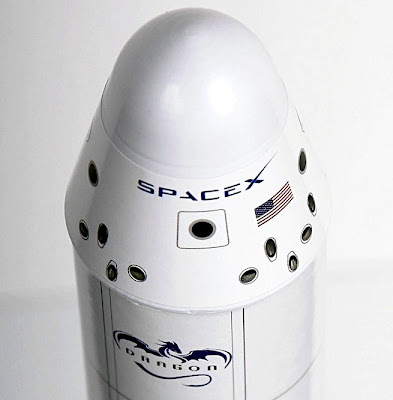 If the SpaceX Falcon-Dragon kit raises some cash to help US astronauts return to the space race, so much the better. 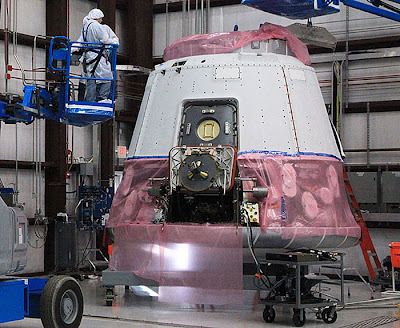 The Dragon capsule has been designed from the start as a human-rated spacecraft. If all goes well, after a number of trial cargo flights, it’ll take over from the old Space Shuttles, to ferry US astronauts to the International Space Station. 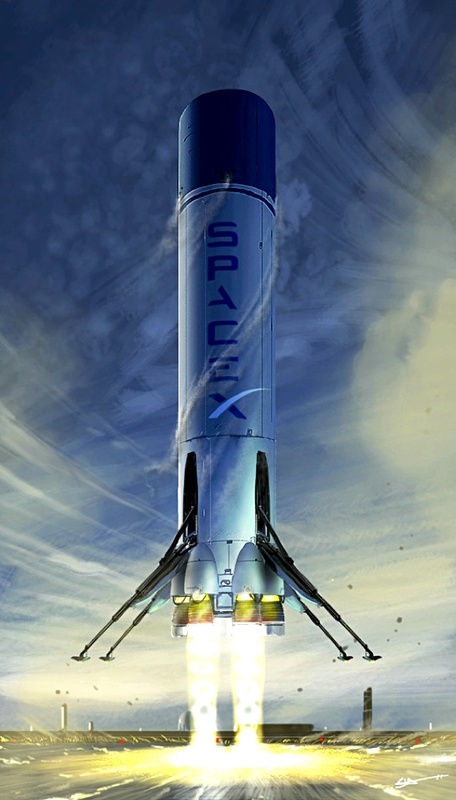 There’s more - Elon Musk is thinking long, with eventual aims to shoot for the Moon and Mars. 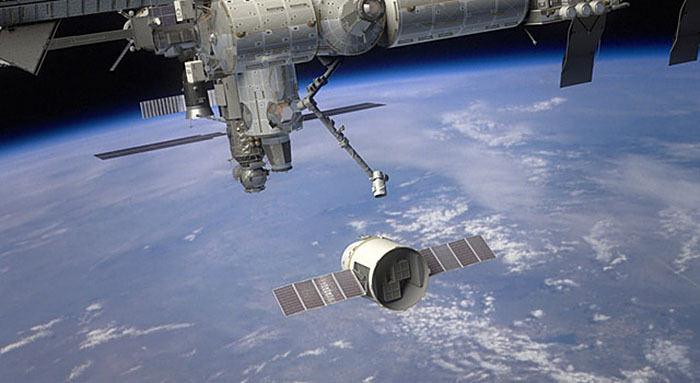 And a developed version of today’s Dragon capsule could make that first touchdown on the distant Red Planet. 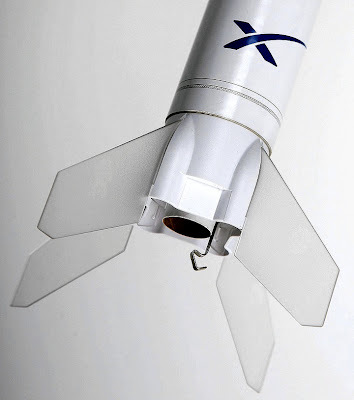 Visit the Lower Hudson Valley E-Gift Shop for a feast of paper model rocketry here. Good stuff at The Rocketry Blog here. 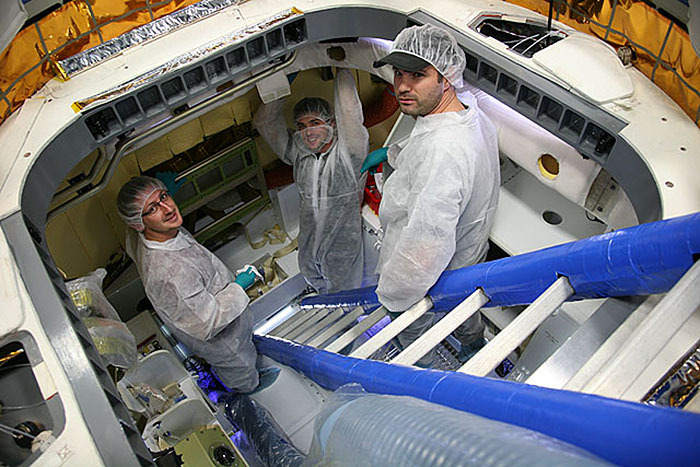 This pic shows the planned Falcon landing system in use. Art courtesy the talented Stanley Von Medvey, whose blog is here.